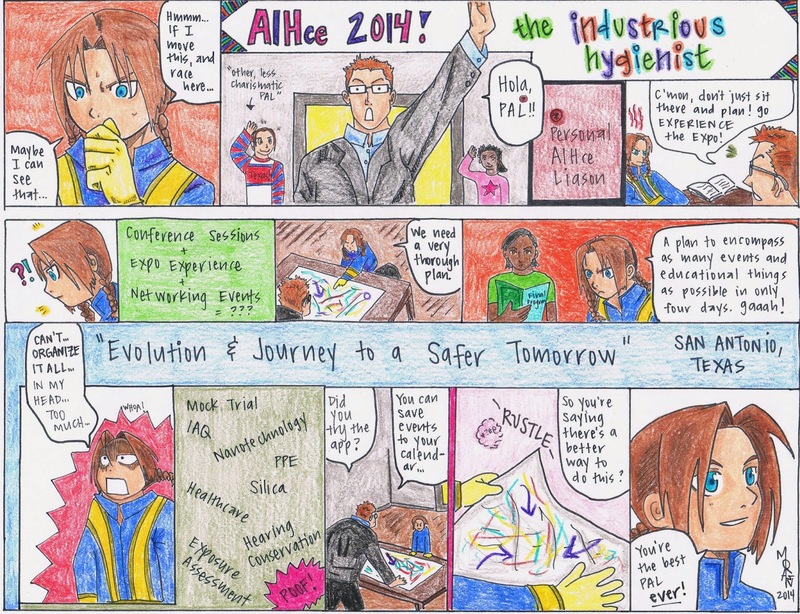 Home AIHA AIHce 2014 CIH Fullmetal Alchemist industrial hygiene blog Industrious Hygienist safety worker exposure Thoughts from AIHce 2014 + a new manga! Thoughts from AIHce 2014 + a new manga! Howdy, all! I recently returned from the American Industrial Hygiene Conference and Exposition (AIHce) in San Antonio, Texas. It was my first time at this conference, which is a little embarrassing since I am a Certified Industrial Hygienist (CIH) and have been practicing industrial hygiene for 8 years now. But conferences are expensive (!?!) and this year I was self-funded - paid my way entirely from my Spore Consulting, LLC budget. Yay for small business success! I signed up for the Personal AIHce Liaison (PAL) program at AIHce, and, admittedly, had low hopes for the program. I thought, "Why would someone who has been coming to this conference for years want to hang out with silly little me and show me the best things to do?" It is the first year for the PAL Program at AIHce, and in my opinion, it was a resounding success. My PAL checked in with me every day, made sure I knew when the "cool" parties were, introduced me to some spiffy new people, and even bought me lunch one day. To say thanks for my PAL's attention and efforts, and to remember the new colleagues I met, I drew a new manga. If you're new to this blog, the art (actual drawing) is mine, but the character stylings are borrowed from Hiromu Arakawa and Fullmetal Alchemist - my most favorite manga and anime. The Personal AIHce Liason (PAL) Program at AIHce 2014 was great!